With a Twist – IHC FUNDEX Equipment offers new techniques for the Canadian market. If you look at the ground conditions in the countries along the coast in the Nord of Europe, it is not strange that a lot of innovative pile systems are coming from these areas. 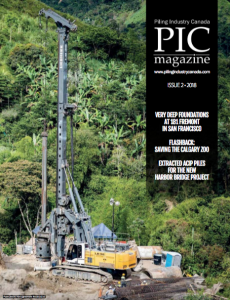 Due to the competition in the foundation industry it is always a challenge to come up with improved and new techniques to obtain the maximum pile production in the most common types of soils. IHC FUNDEX Equipment, who’s main office is based in the Netherlands, together with IHC Hydrohammer are the innovators within the group for foundation equipment. The wide variety of modern and high-quality drilling and piling rigs can be used for almost every pile system. Recently Le Monde International became the representative for IHC FUNDEX in Canada. With the experience of Le Monde International in the field of selling/maintaining drilling equipment in Europe and Canada and the know-how of IHC FUNDEX, the Canadian market will be served very effectively. IHC FUNDEX’s extensive experience with worldwide servicing guarantees a fast support and short downtimes. For low headroom areas, IHC FUNDEX recently delivered a new TBX 35 high-torque drill rig to a U.S. contractor for installing closed or open casings till maximum diameter of 558 millimetres (22 inches) with maximum 450kNm (331900 lbf.ft) of torque. With a unique FCS clamp system, long piles can be drilled with short stroke and extraction of casings can be done as well. The low transport weights and the very low center of gravity helps to get access in difficult terrains. The design makes it possible to work in areas with low headroom and/or narrow access where big rigs cannot reach. Batter piles of an angle till of 45 degrees backwards can be installed as well. The power-pack can be taken off for inside use. The operator can use the remote control from inside of the cab or beside the rig. This rig can install closed screw piles without any vibration and without disturbing nearby constructions. This can be done with or without grout injection. If the limited height prevents drilling of the one piece casing, casing sections are used. After installation the casing is filled with reinforcement and concrete. The high capacity piles can also be used as anchor piles. Compact drill rigs are characterized by high torque compared to the size of the machines. The CD20D with a maximum torque of 200kNm (147512 lbf.ft) can drill casings closed or open till of 368 millimetres (12 inches). The compact design and flexible leader lengths make it versatile. Optionally it can be delivered with different rotary heads, with 120kNm and 200kNm. The CD30S with a maximum of 300kNm is the next in the range off compact drilling rigs. These new compact high torque rigs are recently delivered by two European contractors to install closed screw piles with or without grout injection. With a separate power pack on tracks it is possible to work inside buildings without the problem of exhaust emission requirements. The max hydraulic flow is 211 gallon/min (800L/min) with 280 bar. In 2011, IHC FUNDEX acquired the company VermeerMT from the Netherlands thereby adding a variety of compact piling rigs have been to the range of machines. These rigs are driving casings with the principle of a down the hole drop weight, inside a closed casing. This method is vibration free with low noise making it very suitable to work inside, spaces with low headroom, and in difficult areas. The casing is driven down in segments and welded together. With a long stroke of the drop weight the impact energy is high, if compared with the dimensions of rigs. For example an 10 tonne rig can have a maximum impact energy of 70kNm, which is about the same as a IHC Hydrohammer S70. The stroke of the drop-weight is adjustable and the piling process is automatically computer controlled. A new designed F2200 FUNDEX foundation rig features a mast of 25 metres (82 feet) and is the smallest in multi-functional FUNDEX range. The 250kNm rotary head is specially prepared to make CFA pile with a maximum diameter of 1,200 millimetres (47 inches). An new erecting system ensures a rapid build-up which makes it very suitable for small job sites. Displacement drilling, push-pull system for sheet piles, and pilling with a hydraulic or diesel hammer are also possible with this technology. A new data acquisitions system is available on every rig from IHC FUNDEX’s product range, this ensures the operator achieving the perfect pile and provides complete report of the pile making process. This system is completely integrated in the rigs and can be used for drilling as well as for piling. The advantage of the integration is the fuel saving function that makes piles in an most effective way. For an up close look at IHC FUNDEX’s newest rigs visit them at Connexpo 2014 in Las Vegas, or visit their website www.ihcfundex.com for more details.